I am sorry, I am very busy currently and I am very late ! I will update Airport database next week with may and june new airports. Hi, I landed in Brindisi LIBR. I selected rwy 32 approach but I found Vapp 0 ! Could you please check? Thanks! Which STAR and concrete RWY 32 approach? Hopefully it gets fixed so it's not star dependent (because they are all out of date anyway), the weird thing is that it's there if you just land and take off but disappears at some point during the climb/cruise/descent. I found that the speed changes from a defined value during approach e.g. 180K to 0 (at FAF) instead of the coded value ~160/140K on final. I have not recognized this prob in earlier panel versions. I guess there is a conflict between the flap setting panel code e.g. when I use my Saitek throttle flap lever. So I repeated the flight and exceptionally used nec. flap settings with the keyboard commands PF6 or PF7 w/o speed indication probs. Furthermore I observed that the flap lever arm on the lower panel in the VC does not move using the joystick flap lever. But it moves correctly if I use the keyboard commands. That's weird, I am pretty sure the VC lever moves when I move my axis. I get the VREF myself by slowing down until I get about 2-3* nose up on the slope. I can autoland with one AP pressed so I guess something else went wrong. The plane should not be able to trigger a GA, it has to be you. I am not even sure if they is an AP controlled GA on the Airbus. The TCAS is done by a third party, I believe it should stop when APPR is enabled so planes landing on parallel runways don't trigger it. But I am not sure if that can be fixed. That's weird, I am pretty sure the VC lever moves when I move my axis. Only to be sure that we are speaking from the same panel version: panel 2.0G. Could you please confirm, that the VC flap lever arm moves acc. to the joystick lever axis. If yes, there is something wrong on my PC. The crazy thing is, that the upper ECAM shows the flap movements 1-1F-2-3-Full as expected. It could be different between planes, I am on 2.0C (I didn't know there was an upgraded version) using the A320. It is not unprecedented, the ignition switch has never worked in the VC for me in any version or any plane but it seems to work for everyone else. I will double check when I am on the sim computer and edit this post. Edit- my mistake, as above I have to use the engine popup to engage the ignition and that's where I recalled the lever moving, it does not move in the VC. Even the key commands don't move it and I believe it is because François changed it to custom coding to reflect the real life 1+F behaviour which doesn't work with the flaps axis. I recommend to install the latest panel 2.0G, see Francois´mail from 13. May 2018. Then further discussions might be easier. I agree, that the joystick command AXIS_FLAPS_SET does not work with the panel coding (jet). In theory you shouldn't because François should have coded a restriction on it. Autoland is only available when both AP buttons are on. But i may be wrong! Autoland is only available when both AP buttons are on. yep, at least since panel 2.0G. It's strange that the 2d lever moves correctly, isn't it a case of just copying that code to the VC? Anyway, it's not something I noticed in using it for many months as I look at my own axis to check flap position instead of the VC one. I was on 2.0G, I just didn't copy the .txt file across. Are the A32x_Sounds and A32x_XML_Config gauges 32 or 64 bit? I think you may have said many months ago but I am not sure if I need to copy these or not for P3dV4. I haven't copied these at the moment so maybe it could account for some differences? 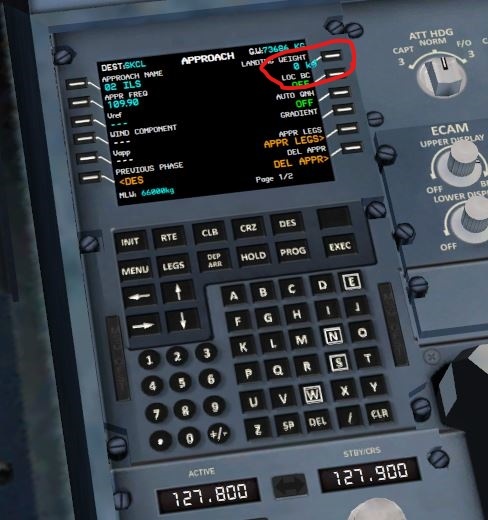 A32x panel 2.0G: The frequencies are not displayed in the A320_CFM VC radio stack. All other aircraft versions A318, A319, A320_IAE and A321 work fine, see examplary pic below. - The VC model is for all versions the same, so this should not be the culprit. - I checked the model.cfg from the A320_CFM and tried both existing aircraft models (A320_200_CFM.mdl from 2011 and A320_200_CFM_noflexlightsblur.mdl from 04.06.2017) but without success. Has this been recognized from other users too? How can this be solved? I will check this evening as the A320 CFM is the only one I am flying at the moment, it's possible an install went wrong somewhere as there's so much copying required with all these updates. Edit - everything works exactly as it should for me. Normally this would be a font issue but I would think that would affect all planes. Thanks, you nailed it. 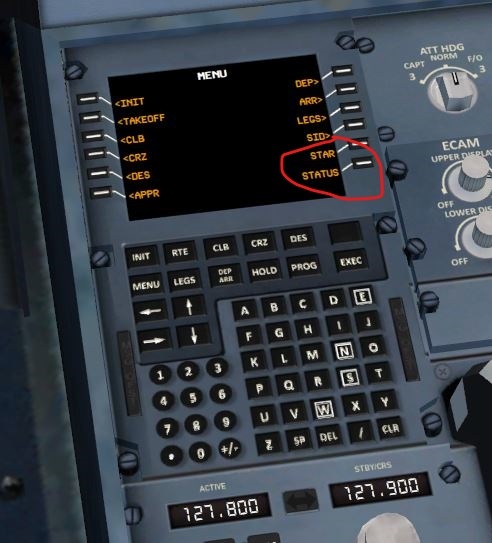 The line "avionics_bus = 1 , 14 , 17.0" should be changed to "avionics_bus = 0 , 14 , 17.0" in the A320_CFM aircraft.cfg, [electrical] section. Now the frequencies are visible again in the VC radio stack. As you stated, all other A32... versions already include the "0". It's been several months since I last flew the A320 FD-FMC and I'd like to ask something. How can I add or remove waypoints in the latest FMC version? Also, how can I manually add waypoints with GPS coordinates? And how can I change the active waypoint? All this is important for me because I fly online, so ATC may give flight plan changes enroute. I don't think you can add waypoints without adding some other kind of FMC (I can tell you how if you have a Carenado Pro line system plane), changing active waypoints is easy, just add a popup of the default GPS into the panel.cfg and use that. It may already be there but I am not sure. I can still autoland with only 1 AP pressed in 2.0G, which file is the new code in? I want to make sure that it is copied across. Thanks. I recommend to install the full panjel 2.0G in one step, not partial to avoid compatibilty risks and I think the installation is much easier. Edit: AP1 land and APPR button on includes currently the flare characteristic with smooth touch down too with panel 2.0G. I get full flare with just AP1 on, I just assumed I must have missed something when copying across. IRL you should not even get the LAND come up and I believe there would be some kind of ECAS warning while on the ILS with just one AP on. Probably IRL is not mandatory but strongly recommended (thus mandatory as standard procedure) in case of one of the two A/P faillure during landing? It's mandatory for autoland IRL for the reasons you state. I don't think the sim distinguishes between different Cats, it seems to autoland on all of them. It should not autoland on CAT I IIRC. STAR and STATUS are missing the > like the rest of the items in the right column. The text enclosed in red is poking out of the screen. It's all gone a bit quiet on here, I am looking to improve a few things I have always had trouble with. 5-No vref or vapp on airports without a star. I am pretty sure I have fixed 1-4 but I am having trouble with #5, I can upload the xml files if anyone wants them and does anyone know how to do number 5? I have changed visibility settings to "(A:Sim On Ground,bool) 0 == " without success. I am pretty sure I have fixed 1-4 but I am having trouble with #5, I can upload the xml files if anyone wants them and does anyone know how to do number 5? That comes from the missing altitude at the waypoints. No STAR no vertical guidance. You use a flight plan created von A to B with all waypoints include the SID waypoints and STAR waypoints. SID and STAR as normal waypoints without altitude. FD-FMC is not for such kind of flights. You can do it but without VNAV. I don't use the SIDS and STARS at all, my ATC provides that, I was trying to find another way to trigger it, radar altitude, gear down or flaps full instead of the approach phase being selected. I think that would be better as it would show for everyone if they had to turn around or divert to another airport. Really sorry for my absence since spring. Many many personnal issue. and I did a heart infarct ten days ago. I tired, but I decided to try to update airport database and aircraft panel. good to know you are back and I wish you all the best for the future. Hi, we all send you our best wishes for your health!